Inventory We are a resale marketplace, not a box office or venue. Ticket prices may exceed face value. This site is not owned by Orpheum Theater Omaha . The Orpheum Theatre in Omaha was built in 1927 as a vaudeville house and is now listed on the National Register of Historic Places. The Orpheum Theater box office is located on 409 South 16th Street in downtown Omaha, Nebraska. 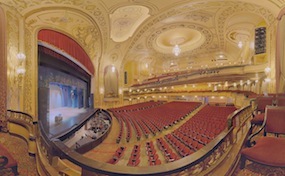 The Orpheum Theatre Omaha has a 2,600 seating capacity and was recently underwent a $100 million renovation in 2002. The Orpheum Theatre in Omaha tickets generally now caters to Broadway Across America events and Opera Omaha. TheatreOmaha.com is an independently owned and operated company that primarily operates in the secondary market. We are not affiliated with any official website, box office, or primary supplier. Tickets may be below or above face value and prices can change hourly. To order tickets for all Orpheum Theater Omaha events call our operators at anytime or follow the easy to navigate steps online to purchase for you show of interest.